Best-in-class fit, function, and style ensure that this men's ski helmet stands out from the crowd. Regulate airflow with a flip of a switch thanks to innovative Dual Active Matrix Venting™, while goggle vents remain open to keep fogging at bay. The all-new 360 K2dialed Fit System™ delivers an enhanced fit. When it comes to lightweight-durability, style, and technical ventilation, the Diversion has it all. Not to mention full integration with your mobile device for communication and audio. 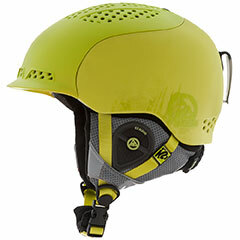 The Hard Shell construction and passive ventilation make the durable and affordable K2 Clutch helmet the choice for skiers and riders who demand the right look for the right price. K2dialed fit system for the ultimate in comfort and adjustability.